The threat of U.S. military action in Syria has put pressure on stock prices and sent oil higher. But if history holds, the actual start of an intervention would quickly reverse those moves. "It's not that it's welcome, but once it gets underway, you can quantify what the situation might look like," said Mark Luschini, chief investment strategist for Janney Montgomery. "When you're left in the dark about when it will start, what will be the result, it gives investors trepidation." U.S. stocks fell 2% last week after Secretary of State John Kerry said last Monday that it was "undeniable" that Syria had used chemical weapons. Oil climbed 2%. Syria has very little oil exports. But the concern in world markets is that U.S. military action there could spark a broader Middle East conflict. Here was the impact on financial markets in past Middle East conflicts. In the two weeks leading up to Congressional authorization of Operation Desert Storm in early 1991, the S&P 500 index fell nearly 5% and oil jumped 12.5%. 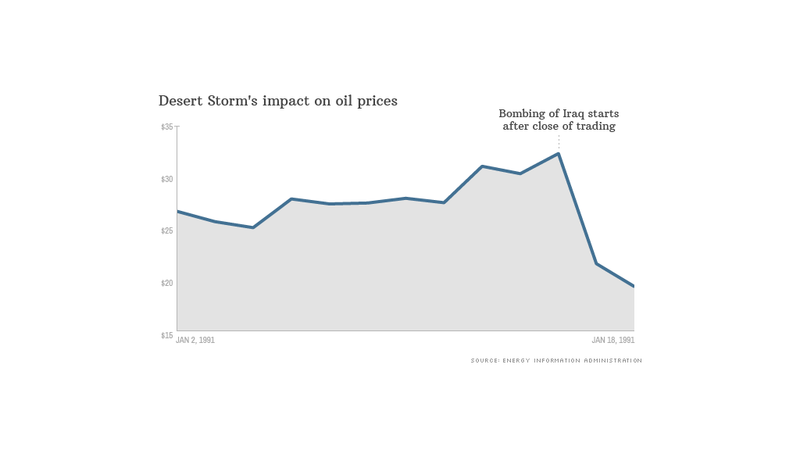 Oil prices rose steadily in the three months before fighting in Iraq began on March 19, 2003. Oil climbed nearly 40%, from $18 a barrel in early December to $25 on March 18. The S&P fell 11% during the same period. Oil plunged 24% and the S&P rebounded 8% in the week after President Bush issued his final ultimatum to Saddam Hussein on March 16. The pattern held in the month before the U.S. intervention in the Libyan civil war on March 19, 2011: Stocks fell 5% and oil climbed 12%. Stocks rebounded after the fighting started, rising 1.5% the first day of trading after military action began, and up 4% by the end of the month. In this case oil prices continued to rise in the first weeks of military action, but they reached a peak a month after the start of U.S. action. But they then started falling steadily, declining 24% by the time rebel forces gained control of the country four months later.